Earlier this year in San Francisco, USENIX hosted their inaugural Enigma Conference, which focused on security, privacy and electronic crime through the lens of emerging threats and novel attacks. We were excited to help make this conference happen and to participate in it. In addition, we were able to share the lessons we’ve learned about protecting Gmail users since it was launched over a decade ago. Those lessons are summarized in the infographic below (the talk slides are also available). We were proud to sponsor this year's inaugural Enigma conference, and it is our hope that the core lessons that we have learned over the years can benefit other online products and services. We're looking forward to participating again next year when Enigma returns in 2017. We hope to see you there! At Google, researchers collaborate closely with product teams, applying the latest advances in Machine Learning to existing products and services - such as speech recognition in the Google app, search in Google Photos and the Smart Reply feature in Inbox by Gmail - in order to make them more useful. A growing number of Google products are using TensorFlow, our open source Machine Learning system, to tackle ML challenges and we would like to enable others do the same. 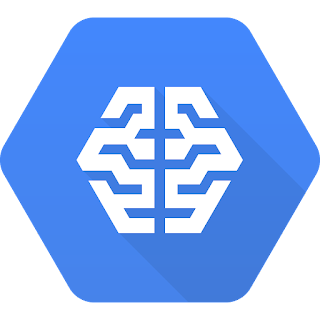 Today, at GCP NEXT 2016, we announced the alpha release of Cloud Machine Learning, a framework for building and training custom models to be used in intelligent applications. Machine Learning projects can come in many sizes, and as we’ve seen with our open source offering TensorFlow, projects often need to scale up. Some small tasks are best handled with a local solution running on one’s desktop, while large scale applications require both the scale and dependability of a hosted solution. Google Cloud Machine Learning aims to support the full range and provide a seamless transition from local to cloud environment. The Cloud Machine Learning offering allows users to run custom distributed learning algorithms based on TensorFlow. In addition to the deep learning capabilities that power Cloud Translate API, Cloud Vision API, and Cloud Speech API, we provide easy-to-adopt samples for common tasks like linear regression/classification with very fast convergence properties (based on the SDCA algorithm) and building a custom image classification model with few hundred training examples (based on the DeCAF algorithm). We are excited to bring the best of Google Research to Google Cloud Platform. Learn more about this release and more from GCP Next 2016 on the Google Cloud Platform blog. Google created the PhD Fellowship program in 2009 to recognize and support outstanding graduate students doing exceptional research in Computer Science and related disciplines. Now in its eighth year, our fellowship program has supported hundreds of future faculty, industry researchers, innovators and entrepreneurs. Reflecting our continuing commitment to supporting and building relationships with the academic community, we are excited to announce the 39 recipients from North America, Europe and the Middle East. We offer our sincere congratulations to Google’s 2016 Class of PhD Fellows. At the end of last year we released code that allows a user to classify images with TensorFlow models. This code demonstrated how to build an image classification system by employing a deep learning model that we had previously trained. This model was known to classify an image across 1000 categories supplied by the ImageNet academic competition with an error rate that approached human performance. 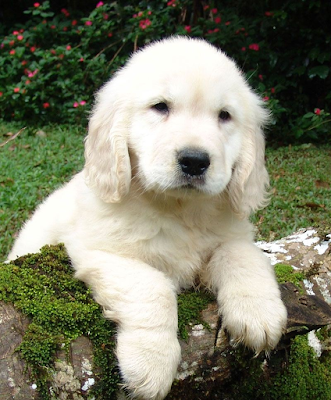 After all, what self-respecting computer vision system would fail to recognize a cute puppy? Well, thankfully the image classification model would recognize this image as a retriever with 79.3% confidence. But, more spectacularly, it would also be able to distinguish between a spotted salamander and fire salamander with high confidence – a task that might be quite difficult for those not experts in herpetology. Can you tell the difference? As described in the preprint, this model achieves 5.64% top-5 error while an ensemble of four of these models achieves 3.58% top-5 error on the validation set of the ImageNet whole image ILSVRC 2012 classification task. Furthermore, in the 2015 ImageNet Challenge, an ensemble of 4 of these models came in 2nd in the image classification task. Exploration of different variants of this model architecture in order to improve the image classification system. Comparison of optimization algorithms and hardware setups for training this model faster or to a higher degree of predictive performance. Retraining/fine-tuning the Inception-v3 model on a distinct image classification task or as a component of a larger network tasked with object detection or multi-modal learning. The last topic is often referred to as transfer learning, and has been an area of particular excitement in the field of deep networks in the context of vision. A common prescription to a computer vision problem is to first train an image classification model with the ImageNet Challenge data set, and then transfer this model’s knowledge to a distinct task. This has been done for object detection, zero-shot learning, image captioning, video analysis and multitudes of other applications. Training an Inception-v3 model with synchronous updates across multiple GPUs. Employing batch normalization to speed up training of the model. Leveraging many distortions of the image to augment model training. Releasing a new (still experimental) high-level language for specifying complex model architectures, which we call TensorFlow-Slim. Demonstrating how to perform transfer learning by taking a pre-trained Inception-v3 model and fine-tuning it for another task. We can train a model from scratch to its best performance on a desktop with 8 NVIDIA Tesla K40s in about 2 weeks. In order to make research progress faster, we are additionally supplying a new version of a pre-trained Inception-v3 model that is ready to be fine-tuned or adapted to a new task. We demonstrate how to use this model for transfer learning on a simple flower classification task. Hopefully, this provides a useful didactic example for employing this Inception model on wide range of vision tasks. Want to get started? See the accompanying instructions on how to train, evaluate or fine-tune a network. Update (August 23, 2016): The data used in this research is now available here. While we’ve recently seen great strides in robotic capability, the gap between human and robot motor skills remains vast. Machines still have a very long way to go to match human proficiency even at basic sensorimotor skills like grasping. However, by linking learning with continuous feedback and control, we might begin to bridge that gap, and in so doing make it possible for robots to intelligently and reliably handle the complexities of the real world. Consider for example this robot from KAIST, which won last year’s DARPA robotics challenge. The remarkably precise and deliberate motions are deeply impressive. But they are also quite… robotic. Why is that? What makes robot behavior so distinctly robotic compared to human behavior? At a high level, current robots typically follow a sense-plan-act paradigm, where the robot observes the world around it, formulates an internal model, constructs a plan of action, and then executes this plan. This approach is modular and often effective, but tends to break down in the kinds of cluttered natural environments that are typical of the real world. Here, perception is imprecise, all models are wrong in some way, and no plan survives first contact with reality. In contrast, humans and animals move quickly, reflexively, and often with remarkably little advance planning, by relying on highly developed and intelligent feedback mechanisms that use sensory cues to correct mistakes and compensate for perturbations. For example, when serving a tennis ball, the player continually observes the ball and the racket, adjusting the motion of his hand so that they meet in the air. This kind of feedback is fast, efficient, and, crucially, can correct for mistakes or unexpected perturbations. Can we train robots to reliably handle complex real-world situations by using similar feedback mechanisms to handle perturbations and correct mistakes? While servoing and feedback control have been studied extensively in robotics, the question of how to define the right sensory cue remains exceptionally challenging, especially for rich modalities such as vision. So instead of choosing the cues by hand, we can program a robot to acquire them on its own from scratch, by learning from extensive experience in the real world. In our first experiments with real physical robots, we decided to tackle robotic grasping in clutter. While initially the grasps are executed at random and succeed only rarely, each day the latest experiences are used to train a deep convolutional neural network (CNN) to learn to predict the outcome of a grasp, given a camera image and a potential motor command. This CNN is then deployed on the robots the following day, in the inner loop of a servoing mechanism that continually adjusts the robot’s motion to maximize the predicted chance of a successful grasp. In essence, the robot is constantly predicting, by observing the motion of its own hand, which kind of subsequent motion will maximize its chances of success. The result is continuous feedback: what we might call hand-eye coordination. Observing the behavior of the robot after over 800,000 grasp attempts, which is equivalent to about 3000 robot-hours of practice, we can see the beginnings of intelligent reactive behaviors. The robot observes its own gripper and corrects its motions in real time. It also exhibits interesting pre-grasp behaviors, like isolating a single object from a group. All of these behaviors emerged naturally from learning, rather than being programmed into the system. Neural networks have made great strides in allowing us to build computer programs that can process images, speech, text, and even draw pictures. However, introducing actions and control adds considerable new challenges, since every decision the network makes will affect what it sees next. Overcoming these challenges will bring us closer to building systems that understand the effects of their actions in the world. If we can bring the power of large-scale machine learning to robotic control, perhaps we will come one step closer to solving fundamental problems in robotics and automation. The research on robotic hand-eye coordination and grasping was conducted by Sergey Levine, Peter Pastor, Alex Krizhevsky, and Deirdre Quillen, with special thanks to colleagues at Google Research and X who've contributed their expertise and time to this research. An early preprint is available on arXiv. What is the best way to get from A to B by public transit? 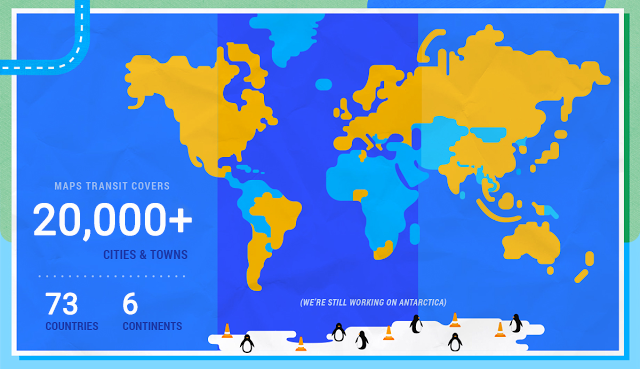 Google Maps is answering such queries for over 20,000 cities and towns in over 70 countries around the world, including large metro areas like New York, São Paulo or Moscow, and some complete countries, such as Japan or Great Britain. Since its beginnings in 2005 with the single city of Portland, Oregon, the number of cities and countries served by Google’s public transit directions has been growing rapidly. With more and larger regions, the amount of data we need to search in order to provide optimal directions has grown as well. In 2010, the search speed of transit directions made a leap ahead of that growth and became fast enough to update the result while you drag the endpoints. The technique behind that speed-up is the Transfer Patterns algorithm , which was created at Google’s engineering office in Zurich, Switzerland, by visiting researcher Hannah Bast and a number of Google engineers. I am happy to report that this research collaboration has continued and expanded with the Google Focused Research Award on Next-Generation Route Planning. Over the past three years, this grant has supported Hannah Bast’s research group at the University of Freiburg, as well as the research groups of Peter Sanders and Dorothea Wagner at the Karlsruhe Institute of Technology (KIT). 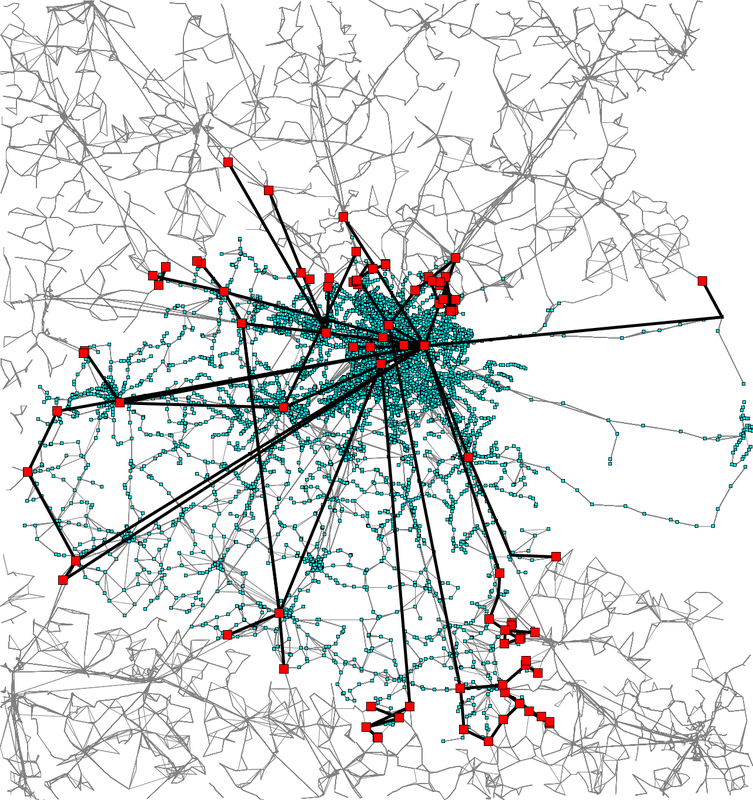 From the project’s numerous outcomes, I’d like to highlight two recent ones that re-examine the Transfer Patterns approach and massively improve it for continent-sized networks: Scalable Transfer Patterns  and Frequency-Based Search for Public Transit  by Hannah Bast, Sabine Storandt and Matthias Hertel. This blogpost presents the results from these publications. Take a tram from A to C, then transfer at C to a bus to B. Take the direct bus from A to B, which only runs infrequently. We say the first option has transfer pattern A-C-B, and the second option has transfer pattern A-B. Notice that no in-between stops are mentioned. This is very compact information, much less than the actual schedules, but it makes looking up the schedules significantly faster: Knowing that all optimal trips follow one of these patterns, you only need to look at those lines in the schedule book that provide direct connections from A to C, C to B and A to B. All other lines can safely be ignored: you know you will not miss a better option. While the basic idea of transfer patterns is indeed that simple, it takes more to make it work in practice. The transfer patterns of all optimal trips have to be computed ahead of time and stored, so that they are available to answer queries. Conceptually, we need transfer patterns for every pair of stops, because any pair could come up in a query. It is perfectly reasonable to compute them for all pairs within one city, or even one metro area that is densely criss-crossed by a transit network comprising, say, a thousand stops, yielding a million of pairs to consider. As the scale of the problem increases from one metro area to an entire country or continent, this “all pairs” approach rapidly becomes expensive: ten thousand stops (10x more than above) already yield a hundred million pairs (100x more than above), and so on. Also, the individual transfer patterns become quite repetitive: For example, from any stop in Paris, France to any stop in Cologne, Germany, all optimal connections end up using the same few long-distance train lines in the middle, only the local connections to the railway stations depend on the specific pair of stops considered. 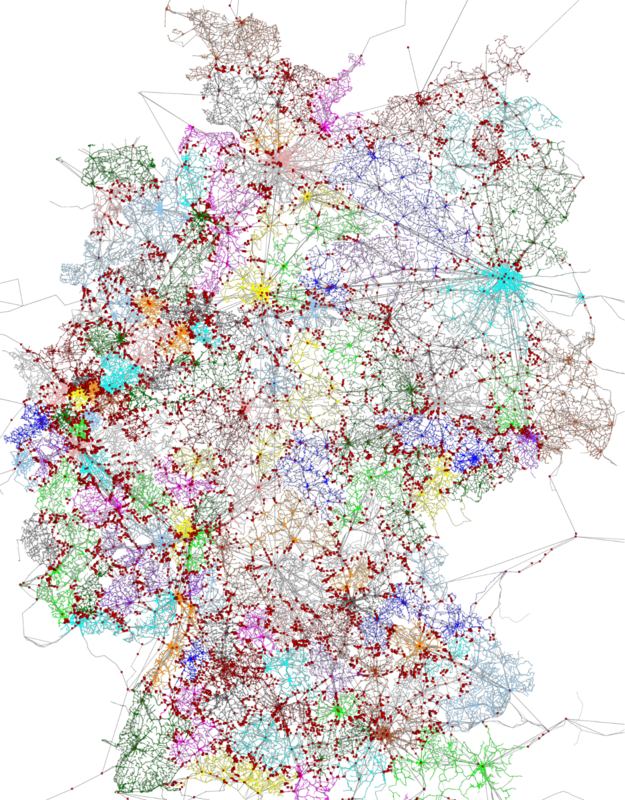 However, designated long-distance connections are not the only way to travel between different local networks – they also overlap and connect to each other. For mid-range trips, there is no universally correct rule when to choose a long-distance train or intercity bus, short of actually comparing options with local or regional transit, too. The Scalable Transfer Patterns algorithm  does just that, but in a smart way. For starters, it uses what is known as graph clustering to cut the network into pieces, called clusters, that have a lot of connections inside but relatively few to the outside. 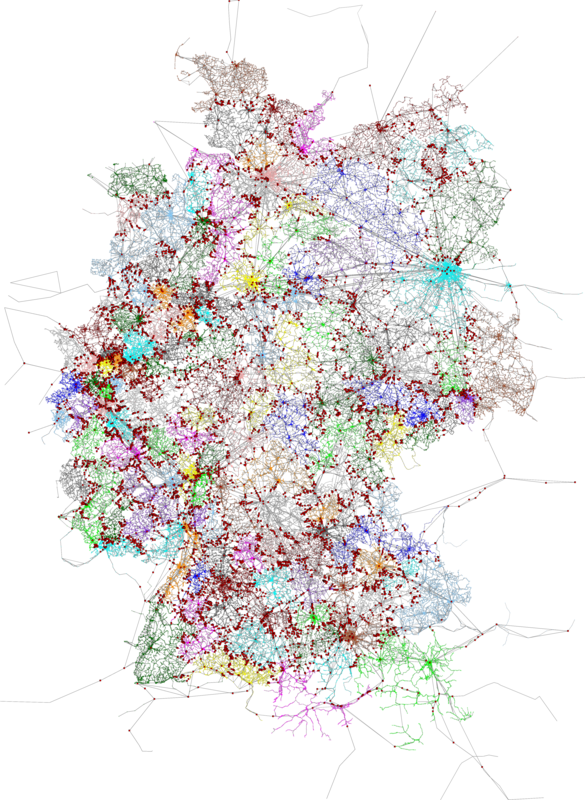 As an example, the figure below (kindly provided by the authors) shows a partitioning of Germany into clusters. The stops highlighted in red are border stops: They connect directly to stops outside the cluster. Notice how they are a small fraction of the total network. Based on the clustering, the transfer patterns of all optimal connections are computed in two steps. In step 1, transfer patterns are computed for optimal connections inside each cluster. They are stored for query processing later on, but they also accelerate the search through a cluster in the following step: between the stops on its border, we only need to consider the connections captured in the transfer patterns. It suffices to consider trips from and to boundary stops of any cluster; the local transfer patterns from step 1 will supply the missing pieces later on. The per-cluster transfer patterns from step 1 greatly accelerate the search across other clusters. The search stops exploring any possible connection between two boundary stops as soon as it gets worse than a connection that sticks to long-distance transit between clusters (which may not always be optimal, but is always quick to compute). The results of steps 1 and 2 are stored and used to answer queries. For any given query from some A to some B, one can now easily stitch together a network of transfer patterns that covers all optimal connections from A to B. Looking up the direct connections on that small network (like in the introductory example) and finding the best one for the queried time is very fast, even if A and B are far away. The total storage space needed for this is much smaller than the space that would be needed for all pairs of stops, all the more the larger the network gets. Extrapolating from their experiments, the researchers estimate  that Scalable Transfer Patterns for the whole world could be stored in 30 GB, cutting their estimate for the basic Transfer Patterns by a thousand(!). This is considerably more powerful than the “hub station” idea from the original Transfer Patterns paper . The time needed to compute Scalable Transfer Patterns is also estimated to shrink by three orders of magnitude: At a high level, the earlier phases of the algorithm accelerate the later ones, as described above. At a low level, a second optimization technique kicks in: exploiting the repetitiveness of schedules in time. Recall that finding transfer patterns is all about finding the optimal connections between pairs of stops at any possible departure time. Frequency-based schedules (e.g., one bus every 10 minutes) cause a lot of similarity during the day, although it often doesn’t match up between lines (e.g., said bus runs every 10 minutes before 6pm and every 20 minutes after, and we seek connections to a train that runs every 12 minutes before 8pm and every 30 minutes after). Moreover, this similarity also exists from one day to the next, and we need to consider all permissible departure dates. The Frequency-Based Search for Public Transit  is carefully designed to find and take advantage of repetitive schedules while representing all one-off cases exactly. Comparing to the set-up from the original Transfer Patterns paper , the authors estimate a whopping 60x acceleration of finding transfer patterns from this part alone. I am excited to see that the scalability questions originally left open by  have been answered so convincingly as part of this Focused Research Award. Please see the list of publications on the project’s website for more outcomes of this award. Besides more on transfer patterns, they contain a wealth of other results about routing on road networks, transit networks, and with combinations of travel modes.